Krill are incredibly tiny animals. They are, at most, only six centimeters long, weigh up to two grams, and can live for up to six years. But despite their humble size they are a key component of the Southern Ocean ecosystem. The species is a major part of the diet of many predators, including fish, squid, seals, seabirds and penguins and whales. In addition, they are a part of commercial fishery and play a role in the carbon cycle. How can we study such a small and an important animal? Sally Thorpe knows how. She is an ecosystem modeler at the British Antarctic Survey. In 2016, she and her colleagues got a grant from the Antarctic Wildlife Research Fund to research krill retention, dispersal and behavior. As she explains, they are planning to employ mathematical models of ocean circulation and sea ice, in conjunction with data collected on krill. 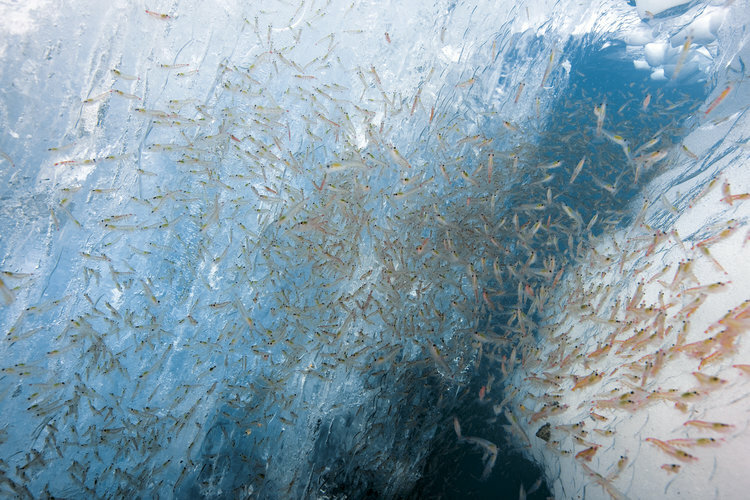 “Yes, krill are small, but they form dense swarms that may have more than 10 000 krill per metre-cubed of water. We can see these swarms in acoustic systems used on research ships and fishing vessels. Through the acoustic systems, we map swarms and get an estimate of the distribution and biomass of krill,” says Dr. Sally Thorpe. They are using data from ocean and sea ice models to investigate why krill are found where they are and how the distribution is likely to vary over time. They will use krill distribution data from krill fishery vessels and data from satellite tags on predators like penguins to check their model results. They are currently analyzing the results, which will hopefully give more insight into a region increasingly affected by climate change. This kind of research is also important for krill fisheries and the Commission for the Conservation of Antarctic Marine Living Resources (CCAMLR), which are responsible for manages and regulates them.